How far downrange will they be when they hit the atmosphere? And does anyone know the airspeed velocity of an unladen payload fairing? Considering the fairings are made by RUAG Space, we need to use the data tables for unladen European payload fairings. So what's your favorite fairing color? I think woods170 may be referring to loads during horizontal integration. You will notice that the payload and fairing are not held via the PAF (Payload Attachment Fitting), but via the fairing halves. Consequently, the load of the payload goes thru the fairing, not the PAF. This requires a strong fairing. Much stronger than those from RUAG et al. The fairing doesn't carry the payload since it doesn't touch it. At worst, during horizontal integration, the fairing half carries its own weight. There was never a good explanation of why they are heavy, except perhaps the desire for them to survive reentry. This photo posted above by @woods170 is pretty definitive. The fairing is carrying the weight of the payload. Did you bother to read the referenced posts from Jim and Joek? The payload is attached to the PAF and the PAF is attached to the bottom of the fairing halves. However, SpaceX does not handle this entire assembly by grabbing hold of the (bottom of the) PAF, but by grabbing the fairing itself. Thus, the load exerted by the payload goes thru the fairing. This applies for all ground-handling sequences once the payload is encapsulated. Lifting, break-over to horizontal, lifting for mating with the launch vehicle. All those are done by grabbing the fairing, not the PAF. Only times the PAF carries the payload are while vertical, and the PAF is sitting on either the encapsulation fixture or on top of the erected rocket. But in all break-over and horizontal operations the payload is carried by the fairing, via the PAF. When the fairing is supported the load of the payload goes through the PAF and then to the fairing. There is no direct connection between the payload and fairing. Correct. See drawing from Joek below. It makes this perfectly clear. No direct connection between fairing and payload. 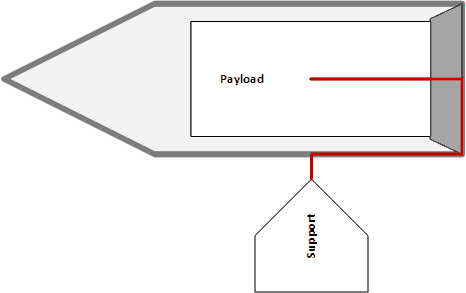 Loadpath (indicated as red line in Joek's drawing) is from payload to PAF to fairing. Hoisting points are on the fairing only. Not on the PAF. So, in any hoisting operation of the encapsulated payload, the load of the payload goes thru the fairing, via the PAF. Surviving the transition to supersonic and max-q are the reasons. The thing is really large (it would easily swallow most people's entire living room), and max-q is a lot of force distributed over a lot of area. No, not the real reason. Same forces apply to fairings from RUAG and other manufacturers. But those fairings are much lighter (mass-wise). Those fairings do not have to carry the payload mass during ground handling. Atlas 5 (for example) grabs the encapsulated payload via the PAF, not the fairing. Ariane 5 first has the PAF and payload integrated on the rocket, then places the fairing over them. Hence, those fairings only need to be strong enough to carry their own weight, unlike the F9 fairing. Granted, we haven't answered meekgee's "why" question yet. Presumably at some early phase of design, SpaceX could have chosen to have hold the encapsulated payload by the PAF during horizontal processing. There would be a lot of cantilever forces, but I'd sure it would be technically possible. They must have done some trade-off and determined that beefing up the payload fairing to carry the loads was worth it. It is *possible* that thoughts about future reuse mechanisms for the fairing played some role in that decision. IE, the "why" might be, "greatly simplifies handling during horizontal integration and the added structure can do double duty if we succeed in our reuse plans." Much like with the sizing of the F9 first stage or the use of common fuels for S1 and S2, SpaceX appears not averse to giving up some performance (due extra fairing weight in this case) if it serves their bigger picture goals of streamlined manufacturing, rapid turnaround, and reuse. How do you mate an incapsulated payload fairing assembly with the second stage horizontally when you cannot grab the fairing? The only attachment points for the adapter is at the mating surface. I don't see how that can be done without adding a lot of mass to the adapter assembly. Remember, the heavy fairing gets off the rocket shortly after stage separation while the mass on the adapter goes to orbit. Maybe the reason the second stage including the adapter are so light is because the fairing is so heavy. Also shines new light on the payload restrictions of about 10 T to the current payload. It was speculated that FH can not bring heavy payloads to LEO because the adapter is not capable to hold heavy loads. Maybe the adapter is not the limitation.. Maybe it's the fairing. Yup. The diagram above is what I understand too. My comments were regarding a) the payload not directly contact the fairing, and b) the fairing only holding the payload, while fully assembled, through the payload ring. (as shown). In that case, the loading seems to me very similar to what a fairing normally experiences, or even more benign. - The mass of the payload times the payload moment arm. FWIW, if maxQ is about 30 kPa, and the fairing were to present an area of 15 m2 to the wind, that's 45 tons of force. If transverse vibrations are, oh, 4 g max, then just the inertia of the fairing would add 16 tons, sideways. Meanwhile, the whole satellite weighs, what, 4-5 tons? So clearly the problem can't be at the ring. What's left is the "eggshell", but if that was a problem, the cart would simply have a larger cradle - much easier than making the whole fairing 2x heavy just so the cradle can remain thin. Long story short - I don't think it's the payload weight during handling. I think a much likelier explanation is that the fairing has to take aerodynamic loads, WHILE IN TWO HALVES, during re-entry. The half-fairing is a very weak physical structure compared to a closed fairing, and I think it the main reason for the extra mass. Just a matter of distributing the loads. SpaceX clearly designed for this, but it shouldn't double the mass of the fairing. Worst case they'd have added a ribbed structure from the support point to the payload ring, which would not weight multiple tons. (And I don't think they needed to do that either). What makes the SpaceX fairing twice as heavy as other fairings has to be a fairing-wide issue, and the only thing that fits the bill is either incompetence (they don't know how to build a lightweight fairing) or some unique aerodynamic requirements - and the second option is staring us right in the face, since we know they're trying recovery. True, but the rocket is designed to fly with an angle of attack, so there's a sideways component. even 10% of 45 tons is comparable to the satellite, and that's on top of the dynamic loads. Also - the moment arm is longer probably about twice of where the satellite CG is. Aerodynamic concerns for recovery don't make sense, because information relating to fairing recovery has indicated that the current fairings were not designed for recovery. The current fairings were designed long before they would have been ready to seriously consider fairing recovery. Also, you are really, really oversimplifying structural analysis in some of your posts. All I'm saying is that the extra weight of the fairing (twice what a normal fairing would weigh) seems excessive for the support outlined, since IMO at the worse case it would have been a small penalty, or more likely, none at all. OTOH, those fairings are doing something else very differently from regular fairings.... trying to perform controlled re-entry... so that should be the likely suspect. Why would that support your case?